Flexible, fast angles for your POV action camera. 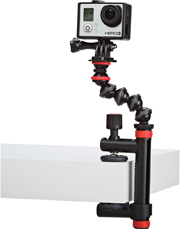 The Joby Action Clamp with GorillaPod Arm provides a simple way to mount your action camera to flat and round surfaces. The Action Clamp attaches to objects up to 2" in width, and provides a tightening screw for getting a firm, tight hold against that surface. The flexible GorillaPod Arm features balls and sockets for five different points of articulation. 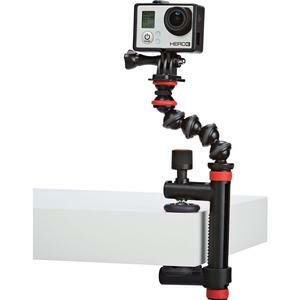 This lets you to quickly position your action camera to get the right angle and elevation for your shot. 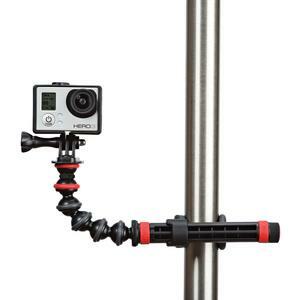 Attach your action camera to the GorillaPod Arm via a 1/4"-20 screw, or use the included tripod mount for GoPro when shooting with your GoPro camera. 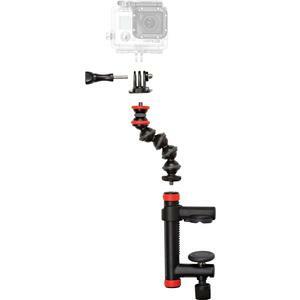 JOBY's award-winning, flexible GorillaPod arm lets you quickly position your GoPro at just the right angle. With 5 balls and sockets, you have 5 different points of articulation to position your camera and get the right angle and elevation.